We supply used LPG tanks duly refurbished at extremely reasonable price . These used LPG storage tanks are above ground , mounded and underground types . The used LPG gas storage tanks are available in various capacities ranging from 500 Liters to 1000000 Liters . The used GPL tanks comes with all safety features as per norms . 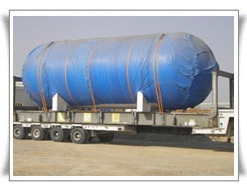 The tanks are provided with all accessories like safety fittings , valves , pipelines etc .